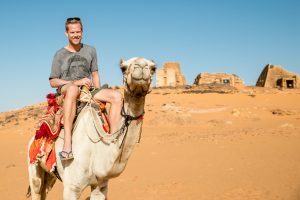 The first four months of my journey through East Africa (Kenya, Tanzania, Rwanda, Uganda, Kenya again and Ethiopia) were relatively simple in comparison to what was to come in North Africa and the Middle East. Finding a viable route back to Europe was rather complicated. Syria, of course, was out of the question. The Sinai desert, which connects North Africa to the Middle East, was closed to 4×4 vehicles after the string of terrorist attacks on the peninsula, including the bombing of a Russian plane last year. Any route leading west of Egypt, such as Libya, was off-limits. Crossing into Saudi Arabia from Sudan and then driving to Jordan was impossible because Saudi Arabia does not allow cars with a right-hand drive on its roads. After considering many different possibilities, it basically came down to three options. Option 1: Travel through Egypt and take the ferry from Alexandria to Athens. Advantage: Only ship the car once. Disadvantage: Egypt has had numerous security incidents including terrorist activities, and duties to enter the country with a car are in excess of 1,200 USD. Also, traveling through Egypt meant skipping Jordan and Israel. 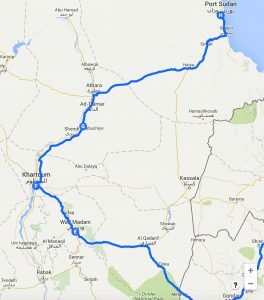 Option 2: Ship the car from Port Sudan to Jordan, drive through Jordan and Israel, and then ship it to Athens. Advantage: See Jordan and Israel. Disadvantage: Ship the car twice, and shipping and clearance is both expensive and slow. Option 3: Ship the car from Port Sudan to Istanbul directly. Advantage: Ship the car once and drive through Turkey. Disadvantage: Skip Israel and Jordan. All the options were tricky, and at a certain point I considered driving back to Mombasa or even further south to South Africa to ship the car from there. In the end I settled for option 2, to ship the car to Jordan from Port Sudan. To get there, however, we needed to enter Sudan (not to be confused with South-Sudan), which could have been a complicated affair. Luckily, obtaining a Sudanese visa was effortless. At the embassy in Addis Ababa, the Sudanese ambassador gestured his assistant to get us some Sudanese chai, black tea with inordinate amounts of sugar, and then moved away from behind his large wooden teak desk to sit with us. We exchanged formalities and explained why we wanted to visit Sudan, and then spent the rest of the time talking about his good university friend Ibrahim, the father of my Sudanese friend Faris who I knew from my Atlantic College days in Wales, and who had arranged this meeting. Ironically, on the walls hung portraits of Omar Al-Bashir, Sudan’s renowned president, who the ICC in the Hague has been after for many years. The ambassador’s kindness was unparalleled, similar to the Sudanese people we were to meet on our journey. Thanks to the ambassador’s support, our visa application was granted within half a day, a process which could have taken a few weeks. The border crossing into Sudan went smoothly, but not far after the border we were greeted by ominous-looking soldiers sitting besides Land Cruiser army pickup trucks with tripods mounted on the back supporting high calibre machine guns. When we later asked about this, we were told they were meant to stop smugglers and refugees illegally crossing the border. While Sudan is rarely a destination in itself for refugees, it does act as a transit country. Having said that, Sudan has absorbed some 60,000 Syrian refugees who have fled the conflict in Syria. 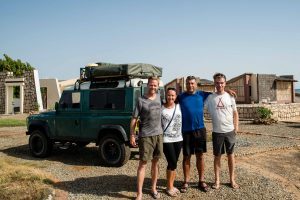 On our first day in Sudan we ended up sleeping in the rooftent of the Land Rover in a backstreet of Wad Madani, which we reached in the middle of the night after a exhausting 5 hour drive through a summer storm in the pitch black night on poorly maintained roads ravaged by trucks. 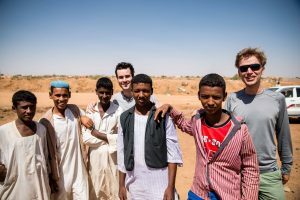 On our journey we had never booked any hotels in advance, yet in Sudan that didn’t work, which resulted in a city camping adventure. I was excited to be back in Sudan, as I had lived there as a child from 1986 to 1988. 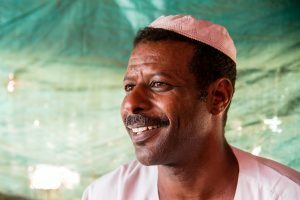 Some of my most vivid childhood memories originated from Sudan, where I had learned to sail on the Nile river and camped by the Meroe pyramids in the Sahara desert. 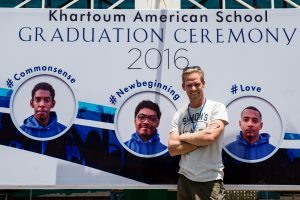 While we were in Khartoum, hosted by my friend Faris’ lovely parents, Ibrahim and Hanim, I took a walk down memory lane and visited the house that we lived in on Street 7, as well as the Khartoum American School where I had gone to school for two years. 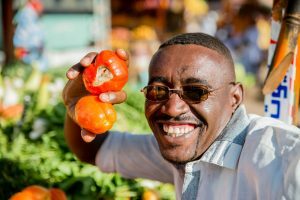 Little had changed, even though the city of Khartoum had morphed into a bustling metropolis with American-like malls and pizza chains, despite the crippling sanctions that had been imposed on Sudan for the last 20+ years. Surprisingly, most of the locals that we spoke to were unequivocally opposed to the government, and they spoke openly about this, despite the repressive regime and the heavy security and intelligence apparatus that kept it in place. During a visit to the Kandahar market in Omdurman with a Dutch friend (Floris) who was doing an internship in Khartoum, we learned about the ways of the NIS, the National Intelligence Service. While waling on the street, he was stopped by a local who claimed to be an English-language student at a local university. His professor had given him an assignment to interview a foreigner to practice his English language speaking and writing skills, and therefore requested an interview. Floris politely agreed to the interview, which started off very normally. However, 10 minutes into the interview, the local began asking questions about Floris’ views on the embargo, Omar Al-Bashir and so forth. Floris thought it was odd, but didn’t think much of it, until he told a Dutch embassy employee a few days later who then told him this was a typical NIS tactic. Much less covert was our experience on the road, where we were stopped almost every 15 minutes at police checkpoints, had to hand over our passports and were subjected to brief interrogations. In Port Sudan we even had to report where we were sleeping and have the manager report back to the checkpoint to verify that we were actually sleeping at the said hotel. Despite the police state, the locals were warm, generous and open. No matter where we went, we were greeted warmly. 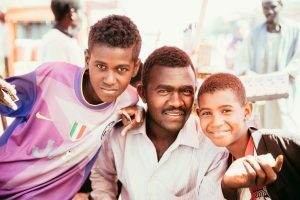 In Port Sudan we were having tea with a former WFP colleague of my father, and when we wanted to pay the bill, we discovered it had already been paid by another colleague who we had met briefly the day before. 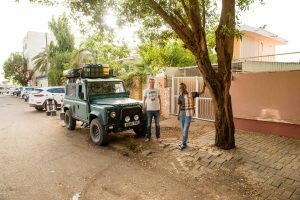 In Khartoum, the neighbour of our hosts had offered to let us park the Land Rover in their garage for security for three days. When we left she gave us a cake for our journey to Port Sudan. When we visited the shipping agent, we were invited to lunch while discussing the terms of the contract. 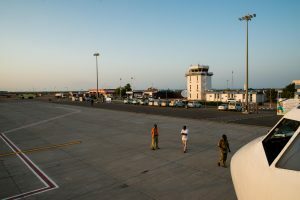 The clearance agent in Port Sudan brought us to the airport after completing the clearance process. Ibrahim, Faris’ father, dropped us at the airport in the middle of the night. Hanim, Ibrahim’s wife, prepared delicious food for us during our stay. And so the list of examples of Sudanese generosity goes on. Heartwarming. We only stayed in Sudan a little over a week, as we had to ship the car from Port Sudan by the 6th of June. About half of the time we were busy with all the administration tied to the shipping process, and the other half we were tourists. 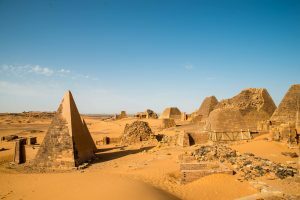 The only three notable tourist experiences were a visit to the ancient Meroe pyramids east of Khartoum, the gated port town of Suakin, and the Red Sea Resort north of Port Sudan. 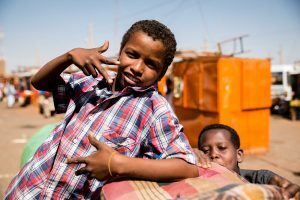 Unsurprisingly, we met no other tourists on our journey through Sudan. In the Red Sea Resort we did meet a crazy Ukrainian couple who had spent 15 years running a dive shop in Sharm el Sheikh, and they had now been asked to develop the diving center of the resort where we were staying. With no tourists, a lengthy and complicated visa process, and run down facilities, it seemed like a prolonged and arduous task, with a very uncertain outcome. 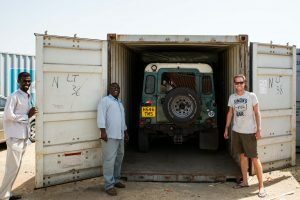 We spent out last four days in Sudan in Port Sudan, where the car would be loaded in a container and head to Aqaba through Oman with a Maersk ship. 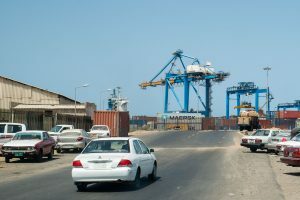 It was a lengthy, drawn-out, painful and opaque process, further delayed by a visit to Port Sudan by the vice-president, which resulted in a shut-down of all the roads that our clearance agent needed to do his work. 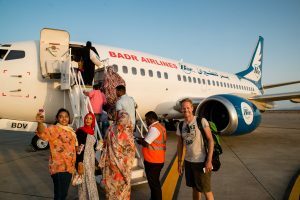 We had planned our flights out of Port Sudan back to Khartoum with plenty of time to spare, but in the end narrowly made our flights. 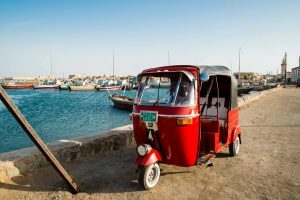 Three hours before boarding I drove the car into the container, met one of the agent’s colleagues on the highway between Suakin and Port Sudan to receive the car documents and paid the agent, completing the process only one hour before the flight’s departure. Four months after departing from Nairobi, it was time to leave the African continent, and what an adventure it had been. Time for the Middle East. Nice to read your blog. Curious now are you travelling next around the middle east and are you coming to visit Oman?? If so let us know. You can always stay with us. Will make your dad jalous ? IT sounds exeptional. While babysitting naughty grandchildren Your blog is a treat! Tjonge wat een reis en reisverhalen!! Fantastisch zijn ook de fotos. Heb je Marius al gevonden of andersom?? Blijf gezond en veilig!! Ik volg jullie vanaf nu graag! Wat een prachtige beschrijving van al je spannende avonturen. De gastvrijheid en de vriendelijkheid van de mensen is opnieuw een mooie ervaring geweest. Daarentegen was het verschepen van de auto een gigantische effort met op het laatste moment gelukkig een goede afloop. Knap dat je je niet af laat schrikken door alle tegenslagen af en toe. Je foto’s van o.a. de pyramiden en de mensen zijn prachtig. We zien uit naar je verslag met je trip samen met Dad door the middle east. Wat super leuk om te lezen en weer zo prachtig opgeschreven. Heel mooi. Ondanks dat ik al veel losse verhalen van je had gehoord, is dit toch erg leuk om zo het gehele chronologische verslag van je avontuur te lezen. Veel plezier in Israel en succes met car-shipping deel 2….. Thanks for inviting us to read your adventures, we will follow from here on. As usual, very nice to hear from you and learn about your adventures. Great choice on the car, used to drive one myself. Probably will serve you well and hopefully will not give you too much trouble. Lots of parts and services available in south of the Sahara Africa I presume. From all sketched options, you probably picked the best, to travel to the Middle East from Sudan, based on our brief experiences with Egypt a few years back. I am sure you will be successful getting through the Middle East and enjoy your company. Wow, zijn jullie in 1974 naar de Danakil Depression geweest? Wat een avontuur! Ik vond het nu al spannend, maar kan mij niet voorstellen hoe het toen was! I love these pyramid pics. They have such a different design than those a bit further up the Nile… I’m not sure if they are retro or rural, but something along those lines. Some of the pyramids in the pictures were rebuilt, as you can probably see! Thank you! 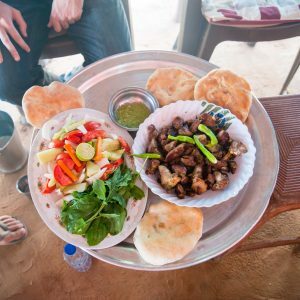 Sudan is certainly worth visiting for its people! Ja Rick, je doet ons ook onze tijd daar weer helemaal op nieuw beleven. Dat onze tijd daar, met al onze ondernemingen en trips in de woestijn dit `exploring-virus` bij jou heeft opgeleverd, hadden wij toen niet kunnen bevroeden. Maar duidelijk is het wel! Je schrijftrant maakt het weer helemaal levend voor mij en dan de prachtige foto´s, wat een mooi vervolg op al je avonturen in de Horn van Afrika! Ik zie uit naar je vervolgverhaal in Jordanie en Israel! 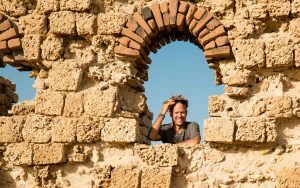 Rick de Gaay Fortman, 37, male, Dutch. 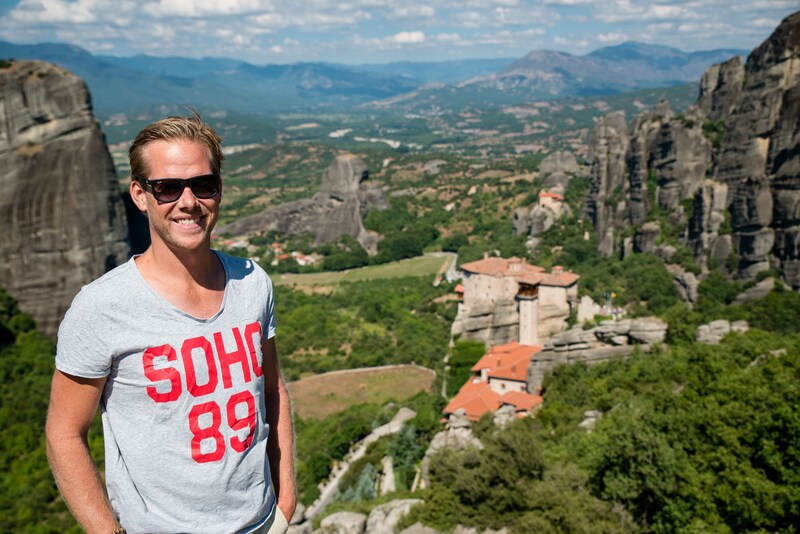 Adventurer at heart, in love with nature, wildlife, photography, the outdoors, spirituality, traveling, Africa. Sign up to receive updates about my overland journey from Nairobi to London! Follow me on the web !